The Arena of Valor World Cup 2018 Semifinals came down to only four teams to fight it out and decide the last two finalists and conclude a long and hard road to the championship title. The Finals stage was held on July 28 and pitted Korea against Thailand with the World Cup on the line. The Arena of Valor World Cup 2018 concluded this past weekend as the four teams from Thailand, China, Taiwan, and Korea fought to determine the first AoV world champion. The games were set to a Best-of-5 (B05) format – best of seven for the grand finals – allowing for more opportunities for some incredible comebacks from any of the remaining teams. The teams first faced off against each other according to their assigned match-ups. Based on the results, the teams were seeded in either the winners or losers brackets, with two of the teams under the latter grouping fighting it out for the slot in the grand finals on July 28. On the day of the Arena of Valor World Cup finals, Korea clashed with Taiwan to earn the right to challenge Thailand for the championship title. With a 3-0 sweep in the favor of Korea, the grand finals match was decided. With the World Cup on the line, the championship match was nothing short of explosive, with the games concluding at the 7th bout and Korea taking home the first ever Arena of Valor World Cup title. 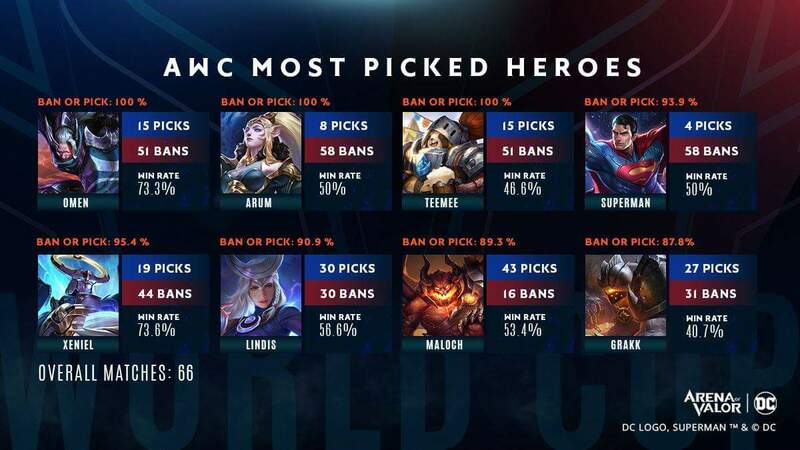 Below are the special awards given to teams and individual players in the Arena of Valor World Cup 2018. We will be updating the information here regularly as we confirm them in the coming days. If readers have information on the awards, please tweet at our twitter account.